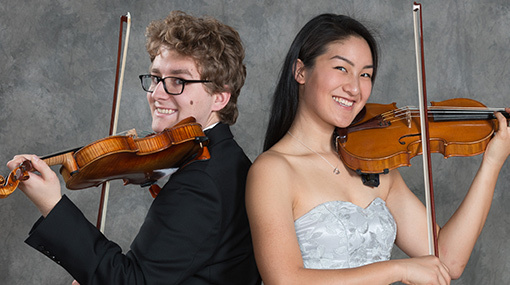 The HSO Concerto Competition provides the opportunity for JHU students to further their musical studies, gain experience in preparing and auditioning for professional musicians, and receive public recognition for their work. The competition is open to all JHU students not majoring in music. Founded by HSO orchestra member Hernan del Aguila (JHU ’08), with support from a JHU Arts Innovation Grant, the competition is now a bi-annual event. The next competition will be held during the 2019-2020 academic year. Specific dates below and subject to change. Hopkins Symphony Orchestra oboist Hernan del Aguila (JHU ’08) created the Hopkins Concerto & Aria Competition in 2007-08, as a student-run program intended to give Johns Hopkins University students not majoring in music a chance “to further their musical studies, gain experience in auditioning for professional musicians, and receive public recognition for their work.” Initially, the prize was a performance with the Hopkins Symphony Chamber Orchestra. Winner/s are now invited to play with the Symphony Orchestra, or the Concert Orchestra when applicable. The first competition, chaired by Hernan, received a financial boost from a JHU Arts Innovation Grant and a morale boost when Hernan was awarded the JHU 2008 President’s Commendation for Achievement in the Arts. After being student run from 2007-2009, and because no students took over the competition, HSO agreed to organize and carry on the event as a bi-annual competition. View a complete list of previous winners. The competition is open to all enrolled Johns Hopkins University undergraduates and graduate students, including Homewood music minors. Applicants may compete on any instrument or voice. Peabody Conservatory students, JHU postdoctoral fellows, and previous winners of the competition are not eligible to compete. Previous competition runners-up are eligible to compete. Applicants may choose to compete with an entire concerto or solo, with select movements of a concerto, or with an aria (vocalists). Applicants must audition on the material they will perform if selected as a competition winner. Use of sheet music is allowed for both the audition and performance although memorization is preferred. Multi-instrument repertoire is permitted (double/triple concerti, etc. ), but the soloists must apply and compete as a pre-formed unit. Please email hso@jhu.edu with any questions regarding multi-instrument repertoire. Applicants must submit their proposed repertoire for approval in advance by emailing hso@jhu.edu as soon as possible, and prior to submitting their application according to the dates above. Applicants may be denied if their selected repertoire is not feasible. Instrumentalists will audition without accompaniment. Singers may request an accompanist and will be provided one at no cost. *Pianists will be offered an optional one hour block of time prior to the competition, in order to practice on the competition piano. The dates reserved for this are listed above. After competition confirmation is sent in December, correspondence will be sent to pianists in order to schedule this time. The competition is not open to the public. Competitors may request comments from judging panel following their competition performance. Such requests should be sent to hso@jhu.edu. The winner(s) will perform their repertoire, or portions thereof, with Hopkins Symphony Orchestra, conducted by Jed Gaylin, on the final Symphony Orchestra Concert of the season, typically in April. Additional winner(s) may also be selected to perform with the Concert Orchestra on a date to be mutually agreed upon. Judges reserve the right to withhold the prize if they do not deem any competitor qualified to be awarded a performance. Email hso@jhu.edu to confirm concerto competition repertoire prior to submitting online application. Complete the online application and attach a musical resume (2 pages max.) during the online application period listed above. You will be notified by the December date listed above if you have been accepted into the competition. If accepted, you will be assigned an audition time. The judging will be held, on the date/s listed above, in the Shriver Hall Auditorium on the Homewood Campus. The judging is not open to the public. You should arrive at least 30 minutes early to register and warm up. You will have use of a practice room. The judges will listen to 10 to 15 minutes of your piece. If your piece is longer than 15 minutes, please select contrasting sections to play. The judges may ask you to play additional passages. If a 2nd round of judging is deemed necessary by judges, it will take place as listed in the timeline above. Those invited to play in the 2nd round will be notified by 8pm on the first day of the competition by email. All participants will be notified, by email, of the judges’ decision according to the schedule listed above. The winner must be available to rehearse with the orchestra for the rehearsals scheduled for the April concert, mostly on Mondays 7–9:30 p.m., listed above. For more information, write to hso@jhu.edu or call 410-516-6542.